Raghda was the very first employee of STEP-IN. She started to work with us in February 2015. At the very beginning, she was helping with a transformation of an old house into an actual clinic. After the clinic was opened she started to work there as receptionist and translator. Now she has another job at a university, but based on her own words, she can’t imagine her life without STEP-IN. She was one of many that had to flee from the largest Christian city in Iraq, Qaraqosh, when ISIS came in. Despite this terrible experience, she remains strong and believes that once her home city is rebuilt, it will be more beautiful than ever before. I [Interviewer]: How did you start to work with STEP-IN? If I am not mistaken, you were the first employee. R [Raghda]: Yes, I was the first one. At that time, I was living with my family in a rented house here in Ozal city [suburban part of Erbil]. One day, my colleague from the university told me that there is one NGO that needs a translator. Can you go? At that time, I just graduated and I did not know whether my language was good enough. R: Yes, I graduated from the College of Education, Department of English here in Erbil. The university is called Hamdania. It’s like a branch of Mosul university. I studied there 4 years. After ISIS came, we escaped in August but I completed my studies in October. It was February 2015 when I met with doctora Zuzana. They were [Zuzana and Przemek] looking for a house. We rented a house, then we started adjusting it for a clinic. Then they asked me that they need a pharmacist and a translator. Anwer was my fiancée at that time and I told him whether he knows some translator or a pharmacist and he told me about Shawl and Yonan. They [Przemek and Zuzana] met with them and they accepted them. Anwer was not accepted because we did not have a laboratory at that time. After that, me and Anwer married in September, 2015. I: Did they come to your wedding? R: Doctora Zuzana went to America with Katarina [a patient that needed surgery abroad] for a surgery so she could not come. For my wedding it was just field coordinator Peter with Przemek and doctora Pavla. Just before they accepted also Anwer. That was like a gift of our wedding. I regard it as a gift because it came together. At the same day I bought a white dress. Anwer had to sign a contract, so it was like a surprise for me. After that we were a team. Four of us together. Anwer, me, Sawl, and Yonan. In the meantime, a lot of doctors changed but the four of us stayed the same. From that time, it’s good for me. I: For how long have you been working with Zuzana and Przemek? R: It’s been two and a half years. At the beginning it was a bit hard. I was shy but then I said to myself that I have to work. I need to work to help my family and also for myself to increase my knowledge and language skills. I: So you were here as a translator? R: At first I was a receptionist but then we changed our contract and now I am for one week a translator and other week a receptionist. I: And what do you prefer? R: I prefer translation. Because I am a woman and some problems happen at the reception and for me its hard. Sometime with patients you need to be brave. I never face a problem with patients while translating, I always try to be good and satisfy them. I: When you are translating for doctors, do you understand completely the medical conditions they are describing? I: Nice. So doctors have some free time with you. I: So you studied at a university here in Erbil. Are you planning to continue and maybe do a masters degree? R: Last December I got employed there at the university. Because I got first ranked at the university in English language out of all four years so that’s why they employed me. R: Yes, I have two jobs. But I could not stop working with STEP-IN. It was so difficult for me to quit the job quickly. I said to Anwer: I will keep coming as much as I can. I: So what days you work at the STEP-IN clinic? R: Tuesday, Wednesday and Friday. And at the university I am 4 days. I: Wait, three plus four… Does that mean that you work every day of the week? Aren’t you tired of that much work? R: Actually there [at the university] I don’t have that much work. I am helping our teachers, the secretary… What I hate is the road. Every day it’s like 30 minutes. I have to do this if I want to study master. Everybody who wants to do a master needs to work there for two years. I: So you want to study for a master? R: Yes. It is my dream. To have a master in English language. It’s because I want to be a teacher at the university. I: You mentioned that you had to run from ISIS. Before you were living in Qaraqosh? R: Yes. This was June 2014. We came to Erbil just for three days. At that time there was no ISIS yet. Just some bombing. After that, in June, we lived for one month still in Qaraqosh but we were afraid of what might happen. It was a terrible experience. But then in August, ISIS came to Qaraqosh. It was like from 12:30 in the morning the journey to Erbil took us until 11:30 at night. More than 10 hours because whole city was escaping. I: How did you know that ISIS is coming to Qaraqosh? R: Actually, there was a bomb that killed 2 children. One was 5 years and another 9 years old. Also one woman that was 30 years old. She also died. At that time I had a friend that was working in a hospital in Qaraqosh. When these people died, I had my sister also in a hospital. Anwer also, he was employed in a hospital. They took those people to hospital and my sister called us directly, you need to go to Erbil or to some other place. At that time, there was no ISIS yet, but then at 2 o’clock at night they came. I: Did everyone manage to leave? R: No, not everyone. There were elderly people who stayed. I: Did you already know at that time who is ISIS and what they do? R: We only knew that they are called ISIS. Also, we’ve heard what they did to Yazidi people in the villages. They killed the men and took the women. They came to Qaraqosh in August. Until then it was a safe region. The majority of people were Christians. I: After you decided to leave Qaraqosh, did you have enough time to take what you wanted from your house? R: Actually, we didn’t take anything. We thought it’s going to be the same as it was back in June. We’ll just leave for couple of days and then come back. We didn’t even take spare clothes. We took only our ID’s, certificates and some money. We could not go back for these things. We couldn’t go back to Qaraqosh until October 2016. I: Have you been to Qaraqosh since it was liberated? Have you seen your house? R: Me, personally no. But my family yes. Our house is not burnt, but there is almost nothing inside in our house. Everything is stolen. There are some things written on the walls. Something like ‘the Islamic State will stay forever’. I: When you came to Erbil from Qaraqosh, where did you go? R: We first went to the house of my cousin in Shaqlawa [A city located 51 km from Erbil]. It was 5 families living in one house for a while. Then my cousin rented house for us. We stayed there for two months and after that we had to leave. I had my exams in Erbil, my brother had to go to his college in Kirkuk and it was no longer manageable to travel everyday. So we moved to Erbil and rented a house here. But at the beginning, houses in Ankawa [Christian part of Erbil] were so expensive. Many people needed a house so they kind of took an advantage of us. However, after 7 months, the church started to pay for us. This is the last months when they are paying for us. I: Do you know when are people planning to return to Qaraqosh? R: I think this month. The rent is finishing… The priest said yesterday that around 1000 families had already returned. But the city is very destroyed. Most of it is burnt. I: Was it hard to leave from Qaraqosh to Erbil? R: Yes, it was very difficult. We had everything there. I don’t even know how to describe it. But now we are living a happy life. People are saying that life is returning back to Qaraqosh. Yesterday, there was a mass held there and a lot of people went. I have faith that the city will be more beautiful than before. I: Is anyone providing a financial support to the families whose houses were destroyed? I: Is there something else that you would like to share? R: I have Milan. He is 9 months old. I: Why did you choose name Milan? R: With Anwer, we chose another name originally, but then I told Anwer that it is a long name and that we should choose shorter. Then Anwer proposed Milan, I liked it, so we decided to name him Milan. After that, doctor Zuzana called us to congratulate us and she told us that her father is also called Milan. This interview was made in August 2017. Raghda returned to Qaraqosh few days after. It was first of September, Friday afternoon. Her family managed with the help of the Church to repair their house. They are happy to be back home, but as she said, they do not as safe as before. 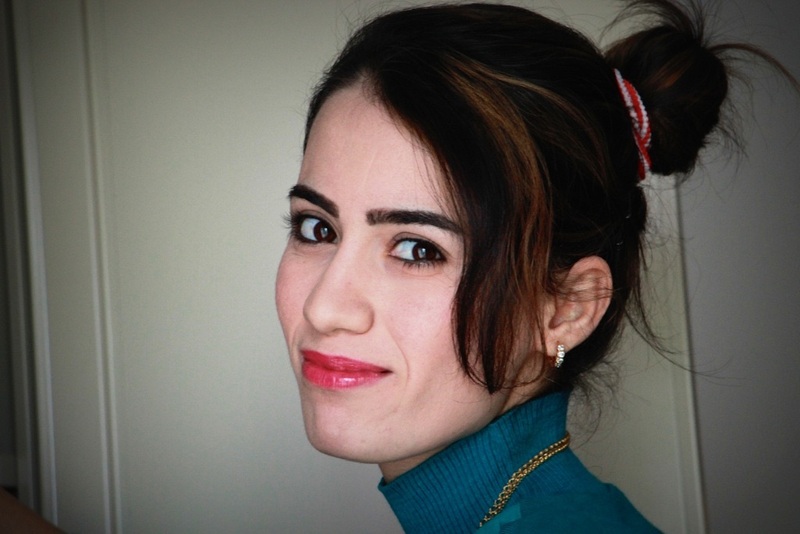 After moving back to Qaraqosh it was impossible for Raghda to continue working in the clinic in Erbil. However, she stayed a dear friend of all STEP-IN team.